The sea urchin wrapped with lardo could very well be your last meal at deathrow. I could do without the lardo as the urchins were meaty and melted in your mouth, the lardo upping the whole combination to another level of indulgence. What is lardo anyway? To me it just sounds like cured fat. 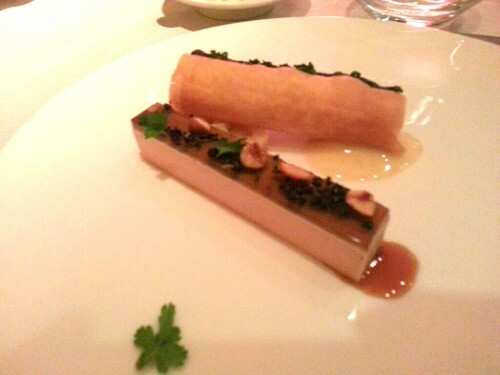 Fegatto: Foie gras terrine, black truffles, cardoons, winter fruits, hazelnuts. I misread the foie gras terrine as a seared foie gras appetizer, but the addition of truffle broken by the sweet of fruit made for a nice melody. Polipo: octopus, chili oil, lemon, parsley. Ah, and the polipo. In an ideal world I would have an unlimited supply of octopus, which always reminds me of Palawan, where in the morning you could pick up some seafood and grill them on an island you sailed to for the day. 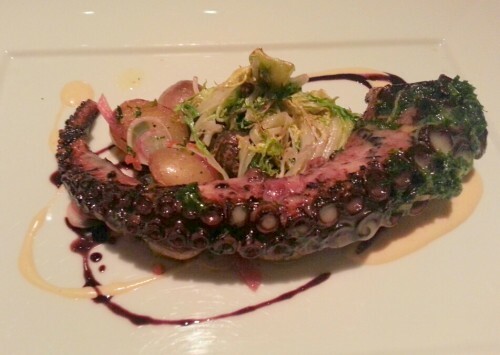 Marea’s polipo gets as gentle a treatment as it deserves, and we loved it! 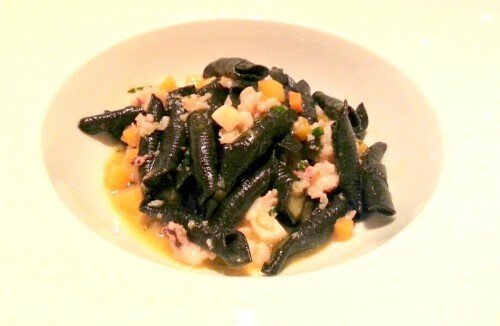 Garganelli: squid ink pasta, seppie, shrimp, scallops, butternut squash. Clean and fresh pasta flavors are so refreshing. The squid ink pasta with butternut squash drew one’s focus to the delicate flavor and texture of the black pasta, accentuated only by a hint of squash sweetness, and the subtle flavors of shrimp, scallops and seppia. 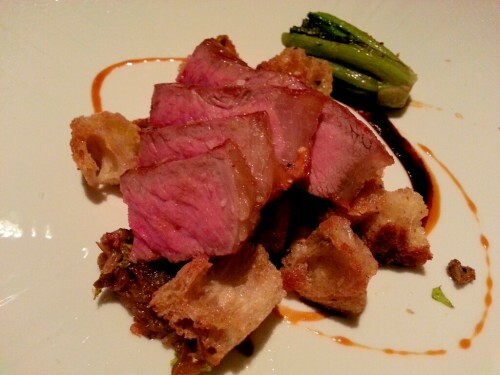 Bistecca: Grilled creekstone 50-day dry aged sirloin, braised romaine, bone marrow panzanella. When it came time to the steak, my wife claimed it was aged for fifty years, so I first held back and said that I refused to eat beef that was older than me. 😀 I was laughing of course, because I knew it couldn’t have said “years.” The fifty-day-aged sirloin arrived medium rare and was the cap to the evening’s meal that definitely sealed the deal. Marea is tucked away in Midtown and Central Park West, steps away from Columbus Circle. It was fancy enough for a romantic dinner but relaxed enough for me to take the food pictures I get to show you. I still regret not having photos of Per Se and Chef’s Table At Brooklyn Fare, but my words will do until I can sneak a camera in my eyeball the next time. Thanks, Marea.